Fourteen hours ahead of Tucson - left the hotel around 8 a.m. heading for the Grand Palace hoping to beat the crowds. Came across a cafe - seats lined up on the sidewalk - everyone facing inwards looking at a small TV screen - Superbowl time Bangkok. Young women - impeccably coiffed, silky black hair piled into chic chignons, tailored short skirts, spikey high heeled shoes, stand in line waiting for a motorcycle "taxi". Hop on side-saddle without disturbing a hair and race off into the maelstrom of Bangkok morning traffic. Tuk-tuks idle waiting for passengers brave enough to ride an open vehicle at exhaust pipe level through the maze of streets. Took one a couple of days ago and whirled into the traffic frenzy at breakneck speed. Taxi takes a short cut through a street lined with gilt Buddha's and temple gods - some on the move. You want a garden Buddha, a sad Buddha, perhaps a miniature or even larger than life - this is the place. 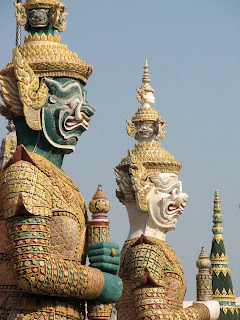 The Grand Palace - neurotic about cultural sensitivity and having read the literature on "proper attire" my little group wore closed-toe shoes, long skirts, elbow length blouses - made the sole male in the party wear long pants. Was correct on the long skirts but the no trouser rule for women seems to have gone the way of the Dodo along with the close-toe shoe etiquette - sandals ruled. Doesn't matter though if you goofed and showed up in a skimpy top and shorts - obliging merchants lined the entrance offering sarongs, shirts and long pants for rent. Annie - Mary Poppins umbrella held high introduced Finn, now two plus weeks old to this world - he slept though the whole thing. Disney couldn't have dreamt this place. 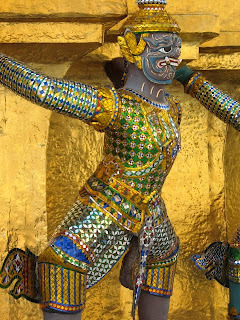 The Grand Palace, started in 1782 defies belief. It is simply the most fantastical place I have ever seen. Not mind-boggling awesome - just fantastic. Behind the white walls is a magical kingdom - elaborate temples, ceremonial buildings and temples. Will write a full description later. Suffice to say - if you are into glitz - this is the place. I'm wrong - it is awesome! Loved the modern touch - artists restoring murals in the gorgeous gallery had i Pods firmly in place and swayed to the music as they worked on paintings first conceived 228 years ago. On the way back to the hotel passed my favourite building - the top floor when lit at night looks just like one of the old rice boats, once familiar sights on the Chao Phraya River.